REVIVAL is back on 15-16th June with REVIVAL: Gaming Legends 2019! 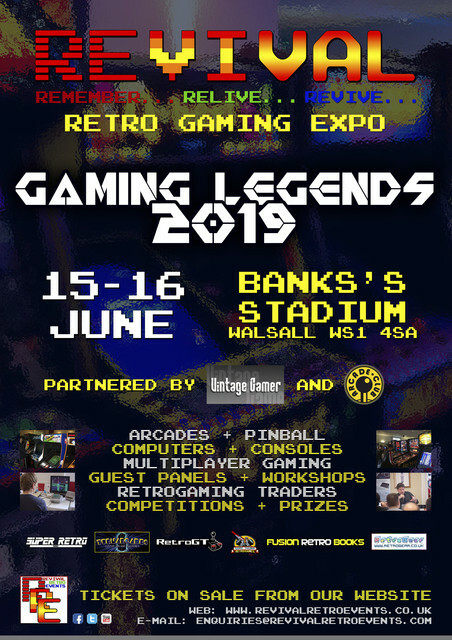 The UK's biggest and best dedicated retrogaming convention returns to Banks's Stadium in Walsall with even more of the same great RRE flavour gamers have come to enjoy over the last 7 years! As well as all the best retro gaming attractions, REVIVAL: Gaming Legends will be focusing on the 2 gaming groups that have made gaming the entertainment platform it is today. Get some face time with 'industry legends' in the talks, indie and specialist development zones as well as Fusion Retro Books' developer meet and greet zone where you'll get chance to discuss their work face-to-face with signing opportunities! We are also celebrating the 'gaming legends' of the home and the arcade whose skills and determination pushed the limits of the games that built the industry to drive it forward, with the first dedicated 'Arcade Legends' tournament, more on-stage and floor tournaments and specialised high score competitions! 2019 will be our best year yet with the input of our committed team and many gaming communities, so make sure you grab your tickets early, grab your friends and come and experience the unmatched atmosphere and perfect retrogaming weekend that is REVIVAL: Gaming Legends 2019!